Total Mass is built with the highest quality protein available today, separating itself from other weight gainers that contain low quality ingredients and high levels of saturated fat and sugar. Total Mass is packed with 52g of PentaPhase Protein and 149g of carbs with just 9g of sugar per serving! In order to help ease digestion Total Mass features an exclusive Probiotic and Digestive Enzyme Blend (PDE) that also increase macro nutrient absorption, help you pack on mass. 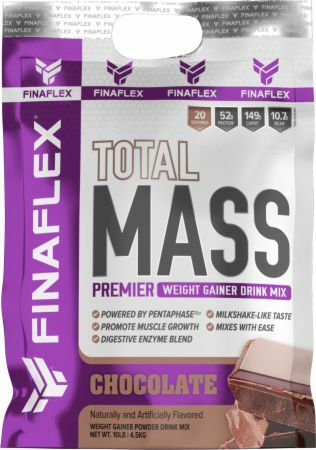 Finaflex Total Mass is exclusively formulated with PentaPhase Protein Technology. PentaPhase boasts a unique blend of 5 different time-released, instantized proteins that break down in the body over 5 distinct phases, in 5 hours! PentaPhase creates an environment in the body that is primed for muscle growth and recovery. The time-released break down of these proteins allow for muscles to utilize (assimilate) protein more efficiently and effectively, maximizing the absorption of the amino acids into muscles. How does PentaPhase work in the body? Hydrolyzed Whey rapidly absorbed by muscles. ALLERGEN INFORMATION: Contains Milk and Soy (as soy lecithin from soybean oil used to improve mixability). 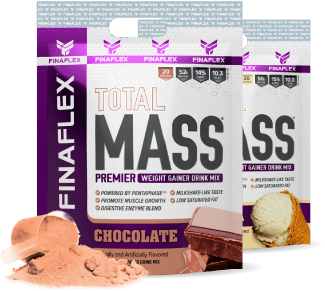 Directions For Total Mass: For use as a weight gainer mix 2 scoops (1 serving) of TOTAL MASS® with 12-16 ounces of cold water and consume immediately upon mixing. For a thicker more flavorful shake mix with 12 ounces of water. For a thinner, milder flavored shake mix with 16 ounces of water. To increase flavor and macros even further mix with equal parts milk instead of water. Intended for use by healthy adults. Please do not use this product as your only source of daily nutrition. Do not use for weight reduction. Warnings: Do not use this product if your health status is unknown. Not intended for use by persons under 18 years old. Contents may settle in transit. Shake bag to redistribute ingredients. Store in a cool dry place. PRODUCT SOLD BY WEIGHT NOT VOLUME.